"Planning a Destination Las Vegas Wedding with style!" 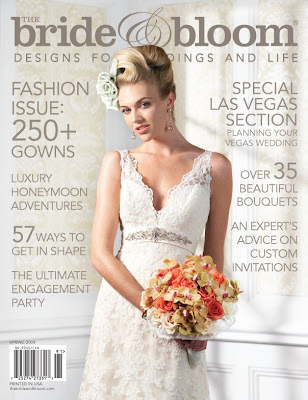 is an article in the latest Bride and Bloom Magazine beautifully written by my friend Tracey Kumer-Moore of Your Las Vegas Wedding Concierge. I love that Las Vegas is becoming a destination of "weddings with style" and Tracey touches on a number of different ways to hold a destination wedding weekend in Las Vegas from spa options at Canyon Ranch to private dining room receptions in various restaurants. Pick up a copy at your local bookstore and read Tracey's article for yourself.